Earning a liberal arts degree is a great way to prepare for law school. Students who study the liberal arts typically develop excellent writing and critical thinking skills, essential skills for all law students and attorneys. There are few American colleges and universities that offer pre-law majors. Although there are few pre-law majors, most schools offer pre-law programs. These programs are managed by advisors who provide students with a road map to get admitted to law school. They typically recommend classes, provide tips for law school entrance exam (LSAT) preparation, recommend majors, and provide advice about applying for law school. and judicial components of criminal and civil law. Select a state below to explore law schools and colleges in your state. of law and practice civil rights law on a pro bono basis. Lawyers who pursue full-time career opportunities in civil rights law typically work with public interest firms, nonprofits and large law firms that focus on many areas of law. The primarily objective of corporate lawyers is to help their clients operate their businesses in manner consistent with law. In short, they tell their clients what they legally can and can’t do. Some of the specific functions of a corporate lawyer include preparing articles of incorporation, establishing bylaws, and managing the process of reorganization via a structured bankruptcy. As a function of their position, corporate lawyers offer legal services that overlap other fields of law, including intellectual property law, contract law, and occasionally securities law–although securities law usually requires the expertise of an experienced securities specialist. 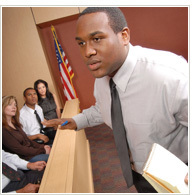 Criminal law is a popular and growing field of law. There are two sides to criminal law: criminal defense and criminal prosecution. Prosecutors and district attorneys represent the prosecution side of criminal law, while defense attorneys represent the interests of those being prosecuted by the government. The field of criminal law is a crucial part of the U.S. legal and constitutional system. Employment and labor law deals with the rights of employees and employers. In the United States employment law is a major field of law that employs a large number of lawyers and legal professionals. Employment lawyers address wage issues, unlawful employment termination, labor hours, safety at the workplace, child labor laws, on the job employee injury, discrimination, and sexual harassment, among others. Labor lawyers, like employment lawyers, address the legal rights of individual employees, however, they also deal with groups of employee, employee unions, special interest groups and government agencies. Entertainment lawyers are tasked with the responsibility of addressing all the legal issues that arise within the film, television, live performance, broadcasting, recording and other entertainment industries. Entertainment law involves many other law disciplines, including contract law, labor law, and intellectual property law. Lawyers help actors draft and negotiate contracts, deal with trade unions, and help songwriters and studios protect their creative works and collect royalties. Entertainment lawyers may also be required to represent their clients’ interests in court. One of the newest fields of law, environmental law is the result of recent concern with the use and abuse of our earth’s natural resources. Lawyers working in this field deal with various natural resource issues, such as hazardous waste practice, oil exploration and extraction, natural gas exploration, air and water quality, water usage and regulation, public land use, energy development and trade, and toxic torts, to name a few. Environmental and natural resources lawyers work for government agencies, special interest groups, corporations (e.g. big oil, etc.) and groups that represent the public. Family law is the realm of law that involves the legal rights and relationships of the individuals that constitute the family unit. Family lawyers are responsible for addressing the problems and issues that arise from the creation and dissolution of the relationships within a family–the two biggest being divorce and adoption. Many family law specialists work as solo practitioners or with small family law firms. Health law is a diverse field of law the involves various legal disciplines. Lawyers that work in this field may work with large firms, private companies or government agencies. They also represent a diverse clientele, including doctors groups, hospitals and clinics, individual physicians, and HMOs, among others. Health lawyers are involved in the development and oversight of public health policy, compliance with Medicare laws, and they investigate healthcare and insurance fraud. They also work directly with healthcare corporations, orchestrating mergers and acquisitions, designing employee benefit plans, addressing complex tax issues, and performing various risk management functions. In our modern era, health lawyers are becoming more involved in intellectual property law, telemedicine, and biomedicine. There is a small subset of lawyers in this field that work exclusively within the realm of health and medical ethics. specialize in just one area. Specializations include criminal and deportation defense, refugee law, asylum law, and business immigration law, among others. Immigration attorneys work directly for individual clients, as in-house legal representation, for large law firms, for corporation that employ large numbers of foreign nationals, and for public/government agencies. their clients and litigate in order to enforce their clients’ rights. As communication technologies have advanced and international travel has become commonplace, nations and economies have become increasingly interdependent, spurring the need for international standards of business and law. The field of international law has grown more in the last two decades than in the previous one hundred years. And as more and more people move to work in foreign countries, immigration and refugee law have also become an ever present force in the international arena. International law specialists can work for public organizations, private corporations, banks, and telecommunication companies. Bilingual lawyers and those with cultural familiarity are in high demand in this field. fossil fuels, working to protect the rights of large firms and oil companies. Just as there are amateur and professional sports, there are amateur and professional sports lawyers. At the amateur level, sports attorneys work with college age students and the organizations they represent to facilitate donations and prevent gender discrimination. Lawyers also work with professional athletes and sports organizations review and draft contracts and resolve antitrust issues. Sports lawyers will represent individual professional athletes, or they may represent the owners of sports teams. A hundred years ago, there was no such thing as a “Tax Lawyer”, but today you’ll find one on just about every corner in every major city. Why? Well, trying to figure out the federal Internal Revenue Code (which is now many thousands of pages) really does take a specialist. As federal and state tax laws have grown in complexity so has the need for professions that with an intimate understanding of these laws. Tax lawyers work with major accounting firms, tax specialty corporations, corporations and small auditing firms. Below you can explore law schools, majors, and legal programs by specialty.